Rosemary Duff Florist, located in San Diego, CA is one of the top 250 florists in the country and top 10 in San Diego County. From custom floral arrangements to lavish wedding productions, RDF specializes in creating one-of-a-kind designs that are inspired by their experience in the business and working with their clients. 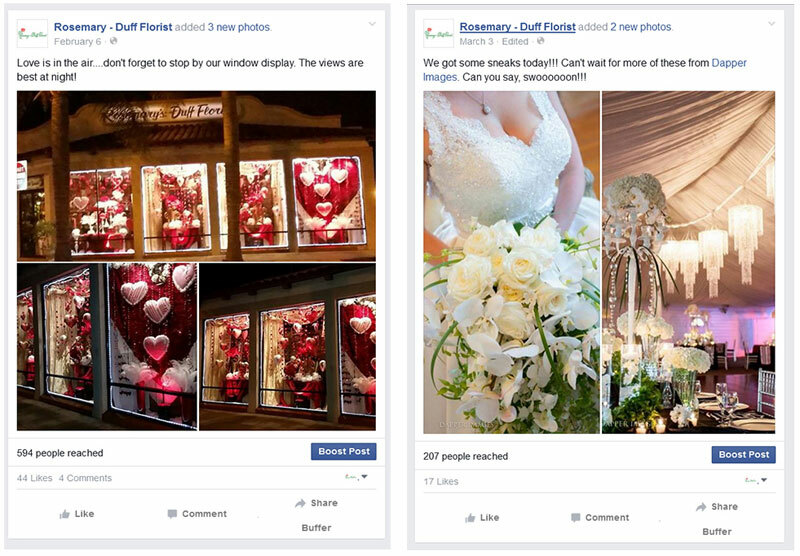 Rosemary Duff Florist came to Twist Agency to build their Facebook presence. RDF had not been sourcing their work online, up until this point, and they have been in business for almost 30 years. Twist Agency created a customized social media marketing strategy, with the goal to humanize the brand using visual images and custom content. Twist let the work speak for itself, by taking photos of the custom arrangements to blogging the weddings that were photographed in real time. Putting the work online opened new doors for RDF, as industry contacts were reintroduced to RDF, in the digital age. Now, their customers and industry contacts can find RDF, when and where they want to online. The online platforms provide a constant revenue stream as constant posting keeps them top of mind to make the target customer think of ordering flowers, just because. Twist Agency has successfully provided RDF with a following of online, loyal customers, while also giving them a stream to reach new customers through Facebook marketing.